Maja, a Young Nauralist in British Columbia, won a Generation Green Award from the Vancouver Foundation. She created a lively web site based on her work restoring a bog. The Center for Wetlands and Stream Restoration is a partnership of agencies, organizations, and businesses working together to restore wetlands and streams, improve techniques for their restoration, and train individuals how they can bring back these ecosystems. The U.S. 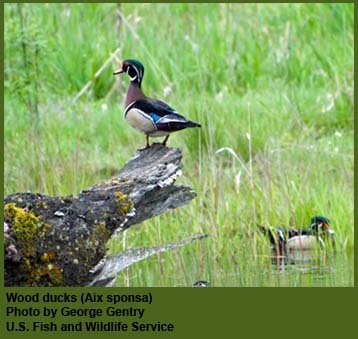 Fish and Wildlife Service is the principal Federal agency that provides information to the public on the extent and status of the Nation's wetlands. The agency has developed a series of topical maps to show wetlands and deepwater habitats. This geospatial information is used by Federal, State, and local agencies, academic institutions, and private industry for management, research, policy development, education and planning activities. Digital data can be viewed and downloaded through several methods. Locate your watershed by entering your ZIP code or the name of a stream, city, tribe, lake, school, airport, and more. Wetlands are identified by many common names such as marshes, swamps, potholes, bogs, fens, pocosins, vernal pools, or playa lakes. Wetlands vary because of differences in soils, topography, climate, hydrology, water chemistry, vegetation, and human disturbance. As a result of this diversity, and the need to inventory wetlands and regulate their use, there are numerous definitions and classifications. Click through this web site and learn about the many types of wetlands, their importance, and the various wetland animals.